A fire and ice party combines elements of light and dark. The fire elements are darker, sometimes representing the evil side of things, while the ice is light and airy, often representing the good side. The elegant look and theme of this style of party makes it a good choice for a charity event or ball. This theme can also be used to make an interesting birthday or smaller party. Build your party around the element of fire, using only a small amount of ice. Drape the tables in red satin or red velvet for a rich and expensive feel. Large centerpieces of red flowers and red candles also work with a fire theme. 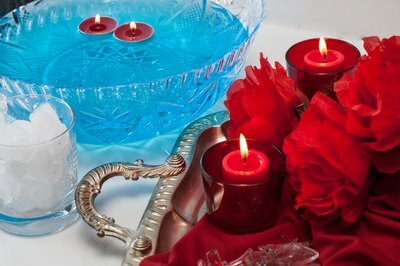 Arrange a few crystal bowls or candle holders around the tables, which act as the ice element. The crystal picks up the fire from the candles and reflects it around the room. Add a small amount of red food coloring to your punchbowls for an extra pop of fire in your theme. A common way of hosting a fire and ice party is to focus on the ice elements first. Use white, silver and translucent colors, which represent ice. Large punchbowls or glass bowls are laid on the tables and filled with clear punch. 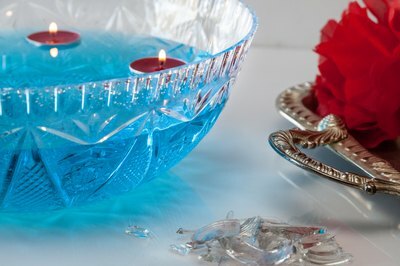 A few drops of blue or green food coloring gives the punch a light shade of color that resembles ice. Place Christmas tree lights or twinkle lights around the tables or around the legs of the tables for extra light in the room. In this party theme, fire is used as a secondary element to highlight the lighter colors. Red floating candles placed inside the punchbowl and red flowers used in your centerpieces provide the bright red color associated with fire. Create ice sculptures for your fire and ice party, using both smaller pieces and large blocks of ice. Melt the top layer of the ice, creating a flat ledge for displaying candles. Arrange red candles of different sizes and heights on top and light them just before the party. Silver trays placed underneath catch any melting ice and work with the ice theme. Cover tables with red tablecloths and use red seat covers on your chairs. White and silver lights placed around the room help reflect the light from the candle flames. A simple tree branch painted white and then decorated with red berry clusters creates another accent piece for the room.